You don't have to wait, you can use Cheapline™ instead. 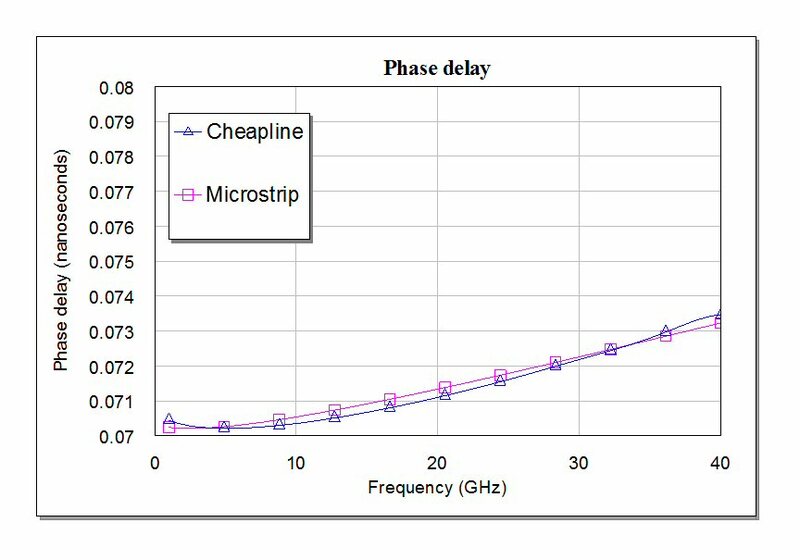 Cheapline is the Microwaves101 method of making a fifty ohm line that doesn't involve masks or etching. Merely cut up a pieces of alumina (Er=9.8) to a 1.5:1 aspect ratio (14.5 mils wide on 10 mil alumina) and you have a fifty ohm line that can be cut to length (or snapped with a blade in a pinch). Note: other materials can be used to make Cheapline, perhaps someone with time on their hands can generate data on the 50 ohm aspect ratio versus the materials' dielectric constants. Here is an HFSS model of one centimeter of Cheapline. Substrate height is 10 mils (254 um), width 14.6 mils (370 um). Note the air box around the conductor, with the lower surface being a conductor (it will be attached to a metal surface). If you want more fidelity you could put a thin bondline of conductive epoxy under the Cheapline in the model. Nah, we're not trying to design a MMIC here. Below the width was swept while the port impedance was examined. Fifty ohms occurs at 370um, Click on the image to see it more clearly. 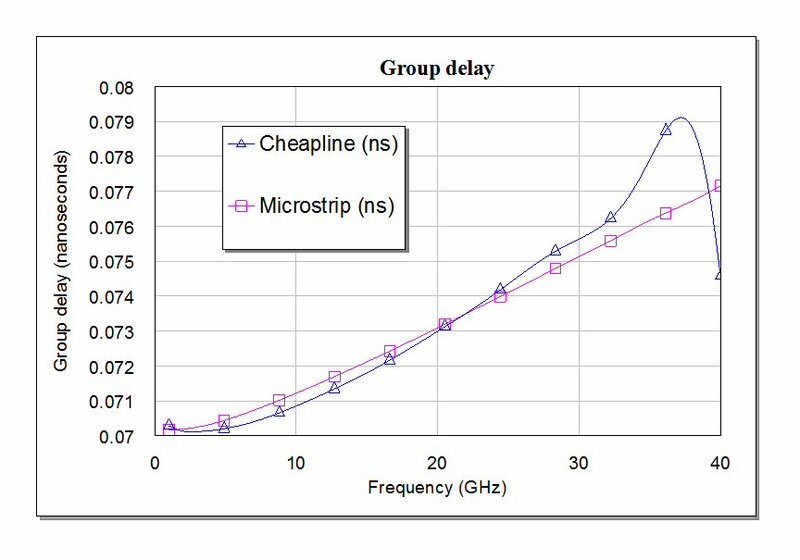 Let's compare Cheapline to microstrip. 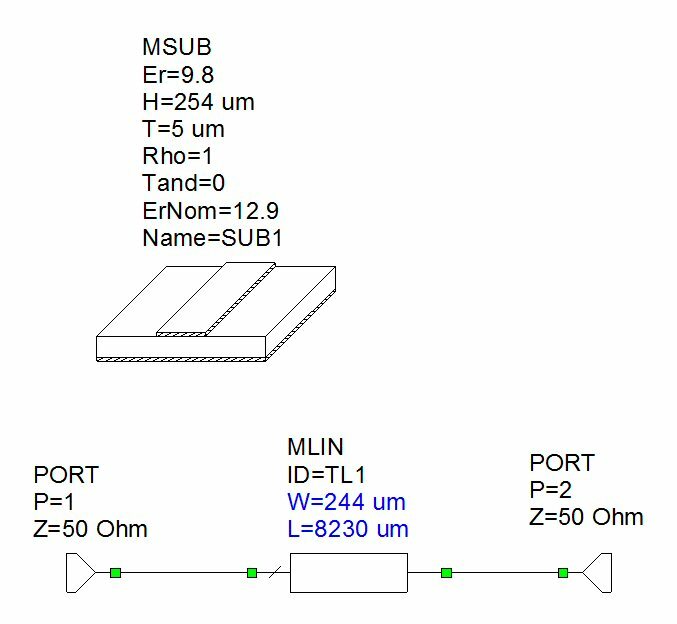 Here we will rely on the Microwave Office microstrip linear model We tuned the width to get good return loss in fifty ohm system, note that it is much narrower than Cheapline for 50 ohms. This is because field lines that bulge out from under the top conductor are captured by the substrate (ER=9.8) instead of air (ER=1) in Cheapline. Here is the unwrapped S21 phase of our microstrip and Cheapline circuits, we adjusted the length of the microstrip line so it is equivalent to 1cm Cheapline. It is 18% shorter, as it has a higher effective dielectric constant. For the application we are describing, who cares? 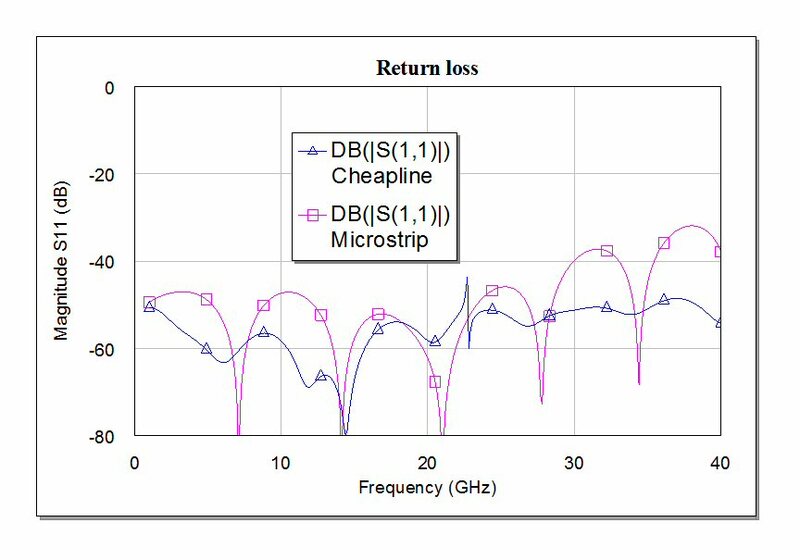 Below is a plot of return loss of our Cheapline HFSS simulation as well as the microstrip. Because they are electrically the same length the VSWR bumps should all be in the same place due to constructive interference. There's a bit of a whoop-de-do in the Cheapline sim around 25 GHz indicating that the solution is imperfect, but we pronounce it "perfect enough". In case you were worrying about time dispersion, below the group delays are compared. When would you care about time delay dispersion? Perhaps only in the case that you were designing a time delay unit. The messy response of Cheapline above 30 GHz must be blamed on a meshing problem in HFSS, there is no reason for it. assuming phase is in degrees. 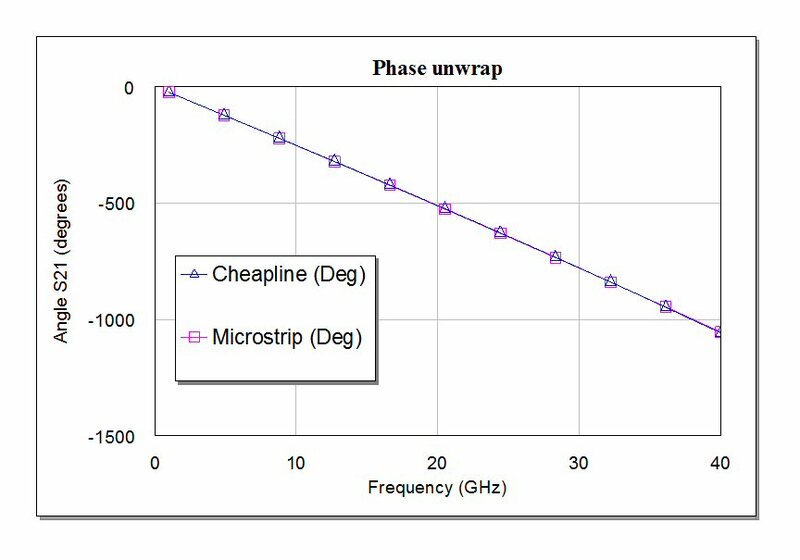 If frequency is in GHz, phase delay will be in nanoseconds. It is similar to group delay but is seldom referenced. This is because group delay often easier to calculate. Phase delay can be ambiguous, particularly for long networks where your data starts at a frequency where the network is already more than a wavelength long. Both group delay and phase delay can be ambiguous, if frequency steps are wide enough so that phase rotates more than 180 degrees. We'll dive into this topic soon. 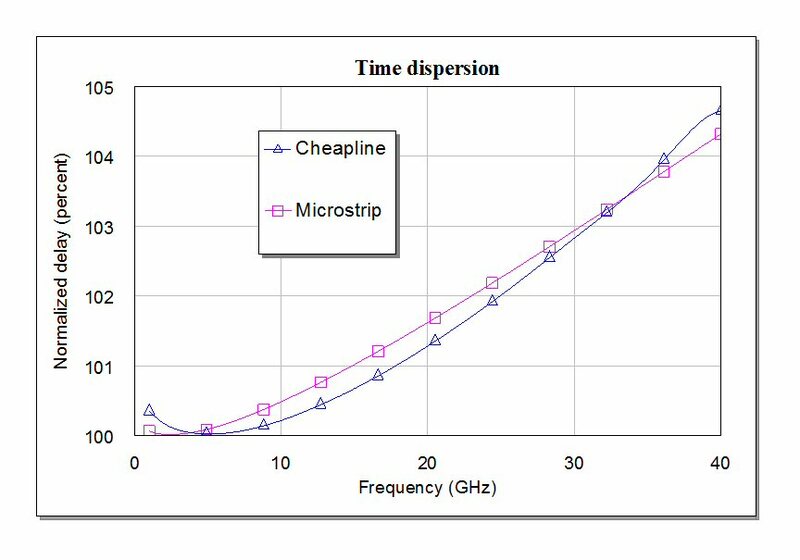 We didn't try to analyze this, but Cheapline is lower loss than microstrip, as it has more metal and less dielectric. In order to present apples versus apples, we'd want to analyze both structures in a 3D EM tool under the exact same conditions. Cheapline cut from alumina has an aspect ratio of 1.5:1. Therefore, 10 mil alumina should be cut 15 mils wide, 5 mil alumina should be cut 7.5 mils wide, etc.